The U.S. Postal Service produced a net loss of $562 million in the second quarter of fiscal 2017, though it essentially broke even on the controllable part of its business. The controllable profits -- which exclude certain non-operational expenses such as congressional mandates to prefund future retirees’ health benefits -- were just $12 million, down from $576 million in the same period last year. The Postal Service attributed the decrease to the end of a temporary surge in its prices. Operating revenue fell by $474 million in the Jan. 1 to March 31 period to $17.2 billion. USPS regulators forced the agency to decrease the price of stamps and other market-dominant products last year, which officials said Wednesday cost the agency $500 million this quarter. The revenue declines were amplified by continued volume drop offs in first class and marketing mail. They were partially offset by the ongoing growth of package and shipping business, where revenue jumped another 11.5 percent. Despite what USPS Chief Financial Officer Joe Corbett described as “aggressive" steps to manage work hours, the Postal Service’s expenses grew in the quarter thanks in part to an increase in personnel costs. Shipping and package business is more labor intensive and therefore costlier than normal mail delivery. Corbett said even with postal management’s internal actions, it cannot overcome its regulatory and statutory burdens. The impact of the prefunding payments has been reduced, as the scheduled lump-sum installments have been replaced by significantly smaller amortized outlays. Despite the drop in revenue, the $562 million total net loss on the quarter was down from $2 billion over the same period last year. Still, among other reforms, USPS is seeking to virtually eliminate the prefunding burden by requiring all of its retirees to receive Medicare as their primary health insurance provider. A House committee with bipartisan support approved a bill including that change. USPS is also asking the Postal Regulatory Commission to eliminate its price cap, which Congress installed to protect postal customers from the monopoly to which the agency is statutorily entitled for certain products. The Postal Service said the forces of the market -- namely continuing mail volume declines -- are sufficient to ensure the agency does not unfairly raise prices. Large private sector mailers have argued any entity with a government-protected monopoly cannot be trusted to set its own rates. 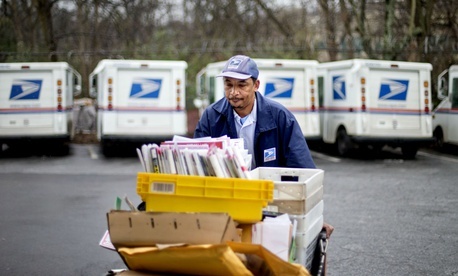 The Postal Service has generated losses in 32 of the last 35 fiscal quarters.